This Spring has brought a lovely litter of wolf-dog puppies to Watermill Wolves and on Sunday 16th June we'll get a chance to meet and fall in love with a few of them! Still super soft and sleepy, clumsy and unbelievably cute – these British Lupine pups/cubs will be coming along with Missy (their mother) and their dedicated handler Natalie, a Behavioural Scientist specialising in canines and an expert on wild wolves. During the class, we’ll be looking in detail at wolf anatomy and learn how wolf packs care for their young in the wild and how their family dynamics mirror our own. As well as drawing, we will discuss current conservation issues facing wolves across the globe – plus the results of their incredible reintroduction to Yellowstone. And 10% of each ticket price will be donated to Wolf Watch UK – a non-profit organisation that provides a remote 100 acre woodland sanctuary in Shropshire for wolves that have been displaced due to zoo closures, dominance fights or excess breeding that would otherwise have been euthanised. They're not open to the public, therefore keeping the environment for the wolves as close to their natural secluded habitat as possible. 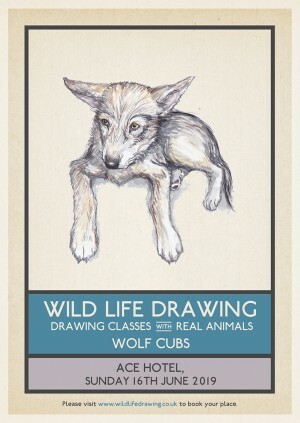 Wild Life Drawing is working with the finest animal handlers, sanctuaries and organisations to put on these events. These British Lupine dogs are friendly and safe, they are devoted domestic pets and are cared for to the highest possible degree by an expert in their species. All the animals that attend the sessions are well used to humans and different environments and are always accompanied by experienced handlers, their welfare is our highest priority.